Last week I shared the decorations I did for my daughter and son-in-law's Velveteen Rabbit Baby Shower. This week I wanted to share the handmade card and tag I made for the gifts my husband and I gave to Ashley and Jason. We already purchased a new crib for our grand baby, but we also wanted to have something for Ashley and Jason to open from us at the shower. 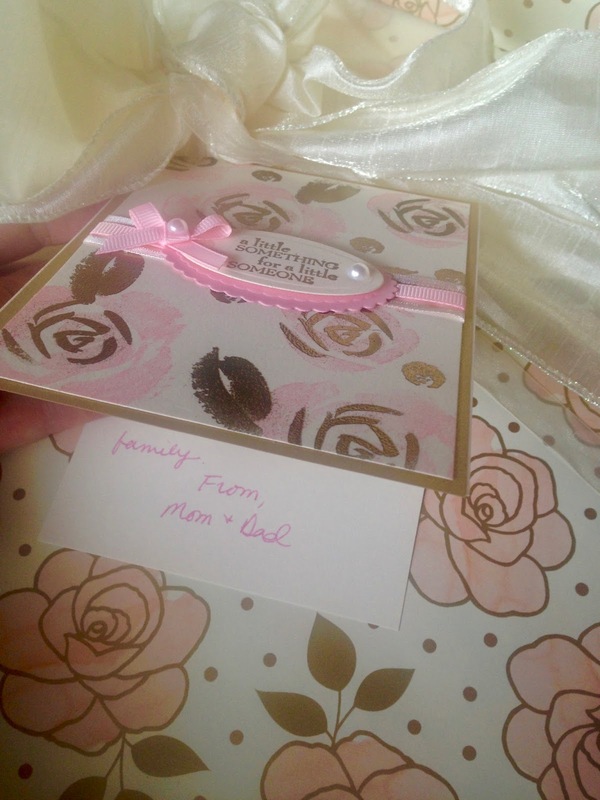 I knew roses were going to play a part in the baby shower decorations, so I wrapped her presents in this lovely pink and gold rose wrapping paper. It's suppose to be wedding paper, but it was perfect for Ashley because I knew she wouldn't like the traditional baby themed gift wrapping paper. Instead of a traditional baby card, I decided to make a card that mimicked the gift wrap design and also a little tag for the other, smaller, gifts. I used an old, retired Stampin' Up! Set called "Roses In Winter" for both the card and the tag. The sentiment is also an old Stampin' Up set. 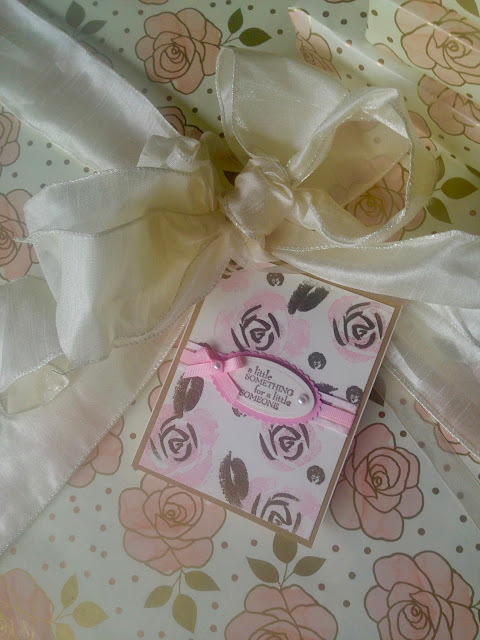 I stamped the card with the roses from the set in pink ink. Then I stamped the leaves, inner roses, and dots with Versamark and I heat-embossed with gold embossing powder. The sentiment was also stamped in Versamark, dusted with gold embossing powder, and heat-embossed. I then cut it out with a Spellbinder's die and popped it up with dimensionals on a scalloped pink die cut. 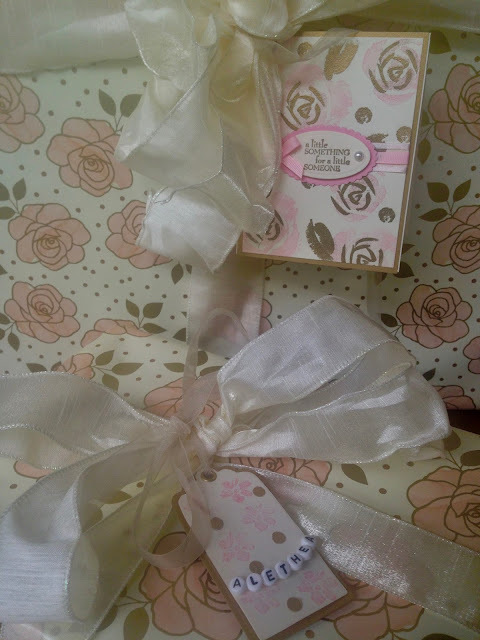 Two kinds of ribbon and some pearl accents completed the card. For the tag, I cut two tags using a Spellbinder's die: one in vanilla card stock and one in metallic gold card stock. I then stamped a small pink rose repeated on the vanilla tag, then added some gold metallic dots which I punched out of the gold card stock using a paper hole puncher. I adhered the two tags together using a eyelet. I created the baby's name using baby buttons and stringing them together and taping the ends to the back of the vanilla card stock. 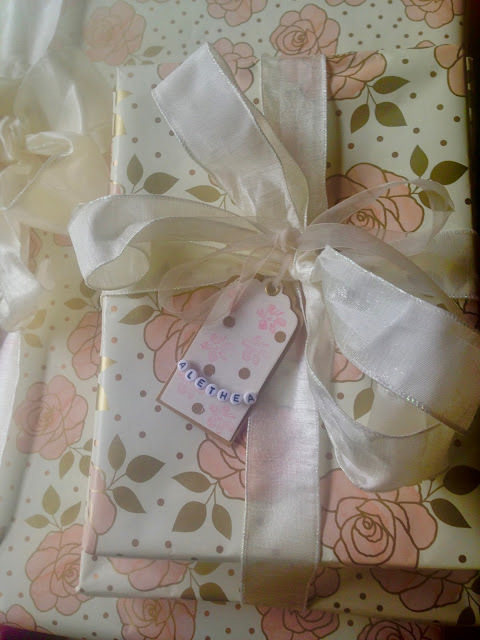 All the presents were wrapped in pretty vanilla bows left over from Ashley's wedding. 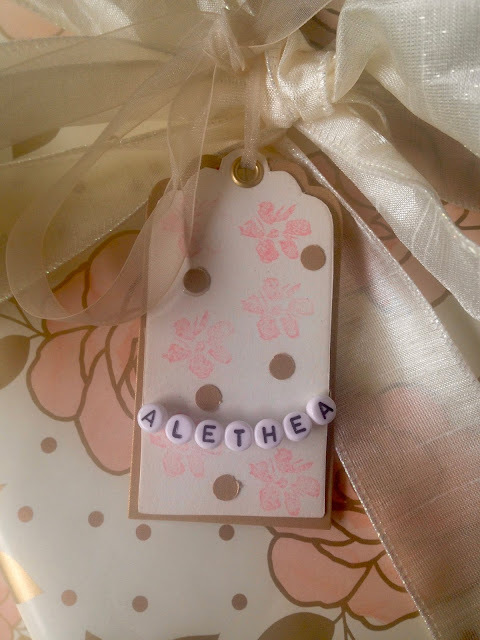 What a beautiful tag and this is perfect for baby shower season! Such pretty cards and love the wrapping paper! How fun that you personalized the tag! 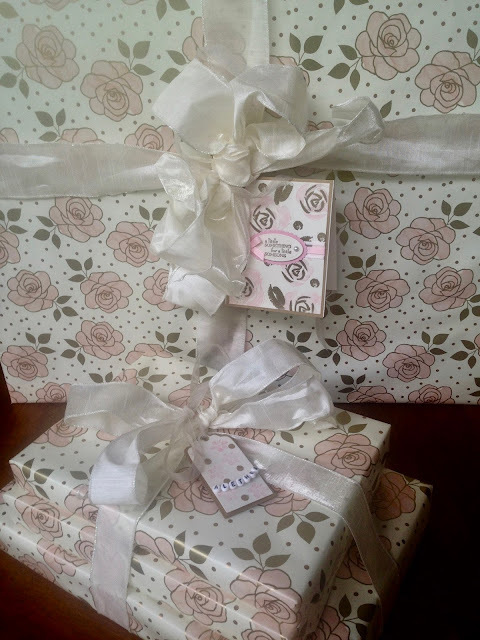 The roses in winter set was a perfect match for the wrapping paper. My daughter had the prettiest baby footie pajamas, white with soft pink roses all over. This set reminds me so much of her onesie. I love roses on baby girl items! Thanks Elli! I really got lucky with that set, it was a close match. Those PJ's sound so pretty! Wow, Amy, such pretty tags and such thought, planning and time you put into this all. It all sounded very complicated and technical, you certainly know your stuff. What great keepsakes. Oh, it's more complicated than it sounds. When you have been paper-crafting as long as I have, it doesn't take too long to create something nice. Thanks so much! My Early June Garden: The Peonies Are In Bloom!